And still no word on the RD-180 certification problem for Starliner. ^ and my guess is there won't be...unless we have an alphabet agency with "issues" with everyone not on their favorites list. Until I see a line item number and the category used, in a particular documented process to present it as an "issue", and with the coherence to defend...it's outright garbage. They have bigger problems than this "issue". Updated Collector Cards and Bookmarks Available Now! New Commercial Crew flight test NET dates. SpaceX moves left a month from the last stated estimate of March 2018. Hope Boeing has that acoustic shock issue sorted out with the new interstage fairing. The interstage fairing, the circumferential airflow disc, the production issues (out of round clamshells), the RD-180 documentation issues, the risk of using GEM solid boosters (remember the Delta II GPS launch?) etc. And I'm still not sold on their idea to close the black zones during horizontal flight, either. Close the black zones? Elaborate please, must have missed that one. a portion of a manned rocket launch trajectory where the premature shutdown of any or all running booster engines will lead to loss of the re-entry vehicle and crew subsequently due to the over temperature or structural loads incurred from the resulting trajectory. Is that too muddy? Black zone does not mean what is going to happen in a normal case, only if an engine (or two or three) quits. Ok, so basically portions of flight where the capsule cannot be rescued by the escape system? SpaceX doesn't have these? I mean, I know they have abort capability all the way to orbit and engine out capability to, but no black zones then? The Falcon 9, because it's so powerful, flies above those zones entirely during flight. It is doing things "the correct way". Likely an orbit of a Dragon 2 when the S2 shuts down after launch will be about the same as a Cargo Dragon headed for the ISS (around 250x250 km parking orbit). No problem. Something goes wrong, they can abort however is appropriate. And there's no issue. We've seen how the S1 comes down a lot when it lands on the ASDS -- same thing applies here and the Dragons (Cargo and V2) can do the same thing during an abort, only they'd land in the drink. Atlas-V/Centaur doesn't have the power to get above the "black zones" until the Centaur is almost 3/4 of the way finished with its' burn. CST is going to be the single heaviest thing the Atlas-V will ever launch, and they're using a flight profile that takes advantage of gravity to assist in getting CST into LEO in order to overcome that lack of power. That's why these "black zones" are coming into question also because there's a chance that CST could slightly contact atmosphere flying horizontally, at near-orbital speeds, still under thrusted power as it's trying to reach orbit. That's a very, very bad thing. Delta-IV Heavy isn't Human-Rated, so they CAN'T use that (otherwise they would have chosen it and not stopped production), nor can it be made Human-Rated. So yeah, there's way more I could go on and on about with this subject, but that's the juicy parts. Yup....that's the advantage of having 1.9 million lbf of thrust on tap to SECO vs. Atlas V's 860,000 lbf + 2 boosters lower down. Yep. Good at launching satellites. 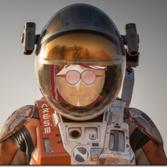 Cargo runs are the limit for the Atlas-V/Centaur. ULA really, really needed Vulcan to be on the 2018 schedule they originally wanted ... then they'd have a contender at least punching in the same weight class as Falcon-9. Yup....that's the advantage of having 1.9 million lbf of thrust on tap to MECO vs. Atlas V's 860,000 lbf + 2 boosters lower down. And, the largest payload Atlas V has ever pushed uphill was the Cygnus AO-4 ISS cargo mission: 7,492 kg. 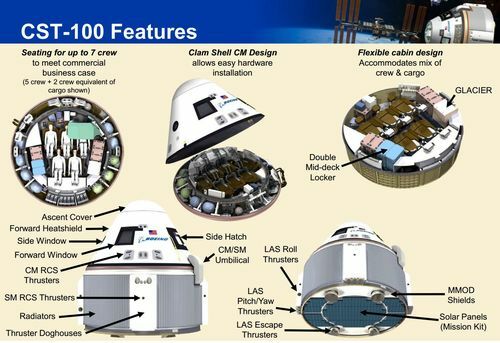 Dragon CRS missions run at least 9-10,000 kg, and Crew Dragon much more than that. Been thinking about this some more today. It's a really, really bad idea to keep CST on Atlas/Centaur. There's almost NO performance margin at all. Remember the LOX oversaturation problem during one of the Cygnus launches near the end of the S1 burn? They nearly lost that payload because there wasn't ANY additional performance in that vehicle to spare, and the Centaur engines are SO underpowered that ULA might as well be using squirrels on treadmills. CST isn't a Cygnus. It's far heavier. We're talking Cargo Dragon and a bit type of heavier. Even if they employ a Dual Centaur it's not gonna be enough until 3/4 to 4/5 of the S2 burn is finished before they have enough energy to achieve a minimum orbit, and then again to finalize their parking orbit -- even with their flight profile shenanigans using gravity. That's assuming they don't use up all their fuel just getting there ... otherwise it'll be a short flight. Better way to go, not to mention cheaper, is to just hire SpaceX to tote CST uphill on a Falcon-9. 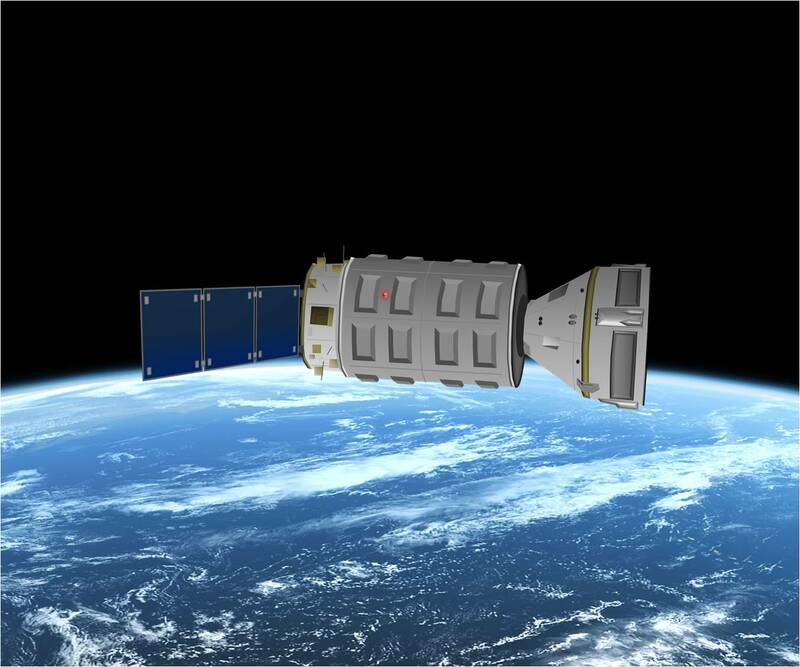 Throw a nice LDSM (Long-Duration Service Module, loosely based on Cygnus tech) full of goodies along with it too. They've been wanting to try out that hardware anyway, why not give ULA more bang for their money? Way, WAY cheaper than an Atlas/Centaur and they can save that rocket for something it was actually designed for. *sigh* Alright. Rant over. Had to get that out of my system. Notable: Boeing will only build 3-4 Starliners total. SpaceX has a Dragon 2 assembly line as it'll be used in at least 2 NASA programs; Commercial Crew and Commercial Resupply Services Round 2 - with Boeing being eliminated from CRS2. The upcoming lunar orbit Deep Space Gateway is a possible third, and there are potential commercial users and the lunar flybys. 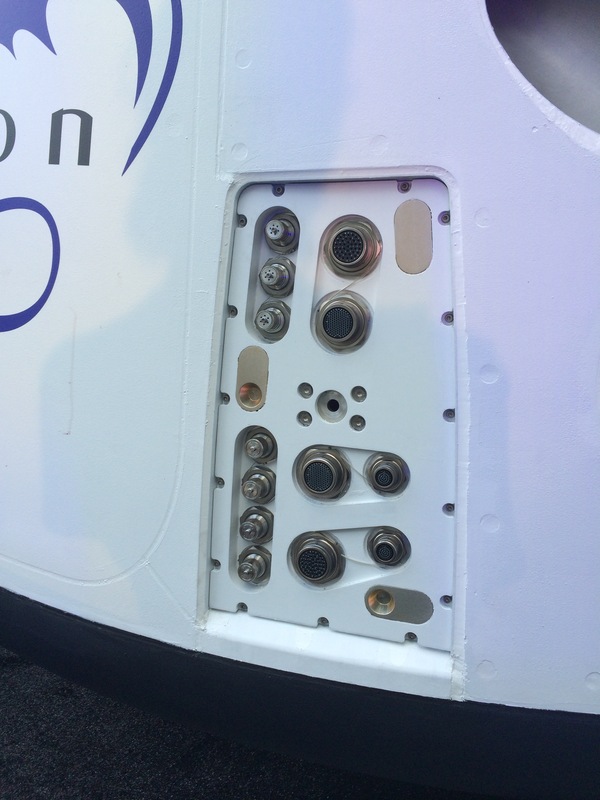 The Dragon Claw connector attached the solar arrays, thermal radiators and other connectors in the Trunk to the spacecraft. a.) SpaceX is in it for the long haul with Commercial Crew. b.) Build quality is excellent ... doesn't get much prettier or tidy than the image above. c.) Even with reuse, Dragon 2's are going to come off the line as needed for the foreseeable future. Is it the American equivalent of the robust and reliable Soyuz platform? Probably .. lots of room to innovate and improve this platform as technologies evolve. d.) We haven't heard the last about propulsive landings .. mark my words. That's still gonna be a thing eventually. e.) Boeing/LockMart/ULA just aren't committed to Commercial Crew now that the "big money" contracts have been reeled in. Years and years of being one of two shows in town (can't forget the Shuttle Program) spoiled 'em. Now they'll go back to doing what they do best - Aircraft and Military Hardware. ULA might get spurred off into its' own entity, but could finally start keeping the money it earns for once. Maybe Bezos can purchase it? The only way I can see Starliner moving forward is if Boeing gets big bux to modify it with a large unpressurized Trunk, solar arrays (its battery life is only 2-3 days) etc. for use as a Deep Space Gateway taxi/cargo hauler. The rumors were it lost out on a CRS2 contract because it was volume and shape limited inside (acute sidewall angle, like an attic bedroom), had no Trunk outside for unpressurized cargo and was too expensive. Yeah. Everything including the design working against it, not to mention the just plain awful decisions made in development. "Apollo on steroids" meets "bureaucracy on wheels". While I'm not really opposed to such an approach, the problems that I have with CST are the lack of any meaningful updates to the platform. The design is just about 15 years old -- I remember even in 2001~2002 hearing about Constellation and how new solutions could be applied to existing technologies, etc etc, the Ares launcher, and all that. The CST is Constellation, rebranded. That's just about it. Not much has changed unless something had to be changed. CST is a mess, and Apollo was a superior product in most ways that mattered. All the CST has going for it is the larger size, relative to the Apollo CM, and a better computer. I'd venture to say that a 2017 model Apollo C+SM would be ounce-for-ounce as good as we'd need it to be until the Dragon 2 was ready. One can only surmise, at this point. Yeah. Everything including the design working against it, not to mention the just plain awful decisions made in development. Yup. Some terrible decisions, one being that godawul sidewall angle. OK for crew, stick their tootsies there, but death for cargo packs or the Shuttle style racks which are now the standard. And what gets me is that it's not even using "common sense" gear. Solar Panels -- surely they would have learned from Apollo? Right now the only item in the options list is a small circular solar array mission kit which folds under the service bay. Not much output at that size. Bottom right. Those aren't even large enough to be useful, not to mention where they're located. I've seen that before and every time I do I keep asking "why". Keep the aft section sun-facing? Yeah, I bet the Retro Package, not to mention everything else in the SM, will appreciate being fried in continuous sunlight like that (radiators or not). So the SM is gonna have thermal issues. It'll barely have a chance to get cooled off before it's right back to sunlight again during orbital ops. Too much of that and it'll start warping, which can throw off the decoupling when they go for reentry. Boomski if it hasn't done so already due to the thermals during orbital ops. Oh, and their elaborate LAS is likely also their Retro Package. Which has been frying and cooling and frying and cooling (etc etc etc) ... nope, nothing could possibly go wrong there either. CST is a bad day waiting for a launch window. 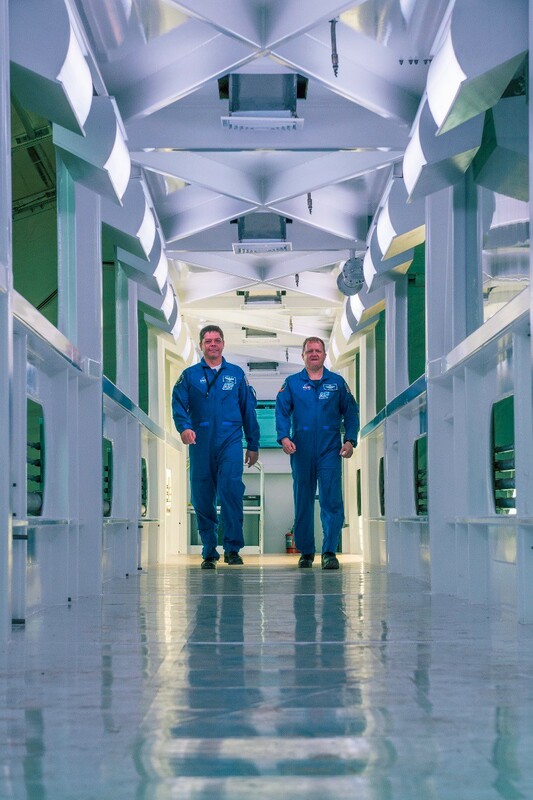 Inside the LC-39A Crew Dragon Crew Access Arm, going up later this year. Looks like a scifi movie set.